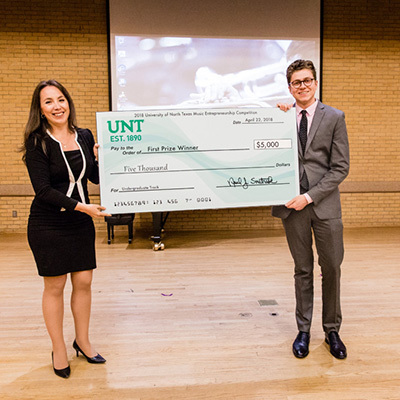 The UNT Music Entrepreneurship Competition provides an opportunity to promote student engagement, entrepreneurial thinking, and innovative action. Students will prepare music business plans utilizing a variety of resources including online business-plan writing tutorials, existing entrepreneurship courses, competition workshops, and faculty mentorship. $20,000 in cash prizes will be distributed among the top competitors. Our 2019 Music Entrepreneurship Competition will be held on April 13th and 14th. Our guest judges for the competition will be Tonya Butler, a seasoned veteran of the music industry and assistant chair of Music Business/Management at the Berklee College of Music, Michael Archer, UNT alumn and owner of the Manhattan Innovation Lab, Debbie Brooks, a UNT alumn and owner of DFW Musician Services, and Jason Levi, UNT alumn and founder of Rise8 Studios. 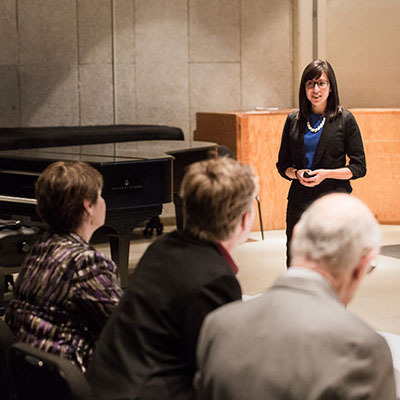 The competition is open to all College of Music students. UNT students outside of the College of Music may be eligible to participate as long as they are working in partnership with a College of Music student. SPECIAL ADDITIONAL AWARDS: Thanks to the sponsorship of Sweetwater Sound Inc, there will be a $1,000 "Audience Choice Award”. An additional $1,000 "Honorable Mention Award" will also be awarded to the winner in the honorable mention category. Finally, thanks to the sponsorship of Rise8 Studios, there will be a $1,000 award granted to the best music products business plan. This award will also include mentorship opportunities from Rise8 Studios founder, Jason Levi.